We embrace this philosophy wholeheartedly. Our thoughtfully planned group travel experiences are designed to uplift and inspire the curious traveler, helping them to connect more deeply with the places they visit. Sustainability, mindful travel, and ecotourism at our core – every excursion brings you closer to the places you’ve always wanted to visit in ways you never thought possible. Specially crafted itineraries put you on the ground and in the field with notable local changemakers and trendsetters who show you what life is really like in their worlds. Experience unique encounters with local wildlife, exclusive city tours from a local’s perspective, and get the opportunity to give back by working with local non-profits. Our trips attract people from a broad spectrum of backgrounds, united by a mutual love of travel and a do-good mindset – you’re sure to forge meaningful friendships and make memories that will last a lifetime. Watch our GoodTravels Teaser video above! We pride ourselves on curating the most culturally immersive, dynamic and well-tailored travel itineraries to ensure our guests a completely unique and bespoke feel to every trip. All of our trips educate while getting you on the ground with respectable nonprofit organizations to make a personal impact on the destinations we visit, all while supporting those amazing causes. This exciting itinerary is the first of its kind. Tons of social impact work, mixed with the music and heritage that so richly underlines Brazilian culture. For this trip we are partnered with Room Service Int'l and Community In Action to celebrate the sights, sounds, and artistic flare of Brazil, all while giving back to an amazing cause. Do the work to make a difference, celebrate with an epic dance party, then retreat to a remote resort to unwind and reflect on your amazing joint experience. 8 nights, 9 days. In partnership with Ubon Safari, this is an action-packed safari that’s perfect for the traveler who wants a fully immersive, adventurous, and in-your-face experience. 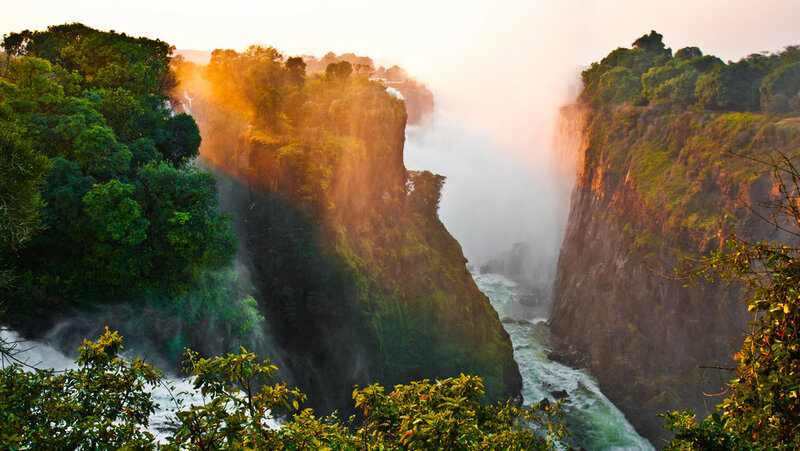 We’ll be covering all the highlights of western Zimbabwe - Victoria Falls, Hwange National Park, and Zambezi Sands, ensuring a dynamic range of activities and prime game viewing. This trip includes walking safaris, river canoeing, and a multitude of ways to get up close and personal with your favorite wild animals! 9 nights, 10 days. Looking for one of the most exotic and breathtaking retreats you’ll ever experience? In partnership with Ubon Safari, this safari is perfect for the traveler who wants a more relaxing, luxury safari experience, who is drawn by the idea of an African retreat. This remote location give you the feeling of having the wilderness all to yourself and allows and for relaxation and reflection. Packed with all the incredible scenery, pools, hammocks and sightseeing your little heart can handle. Visit our gallery to view photos from our previous group experiences! 01. Pick a cause or goal. Do we want to support a cause? Do we want to reconnect people with nature? The sky is the limit here. Not only do we believe in making every experience educational and engaging, but we also believe in being able to support whatever cause we feel is relevant, urgent, or simply doing great work. We specialize in curating tailored events in partnership with nonprofit organizations, and we also specialize in curating immersive trips with ecotourism, voluntourism, and sustainability in mind. When you come to one of our events you can trust you are supporting an amazing cause, and when you join us on one of our trips, you can trust that you’ll get the hands-on, inspiring, one-of-a-kind experience with like-minded individuals that you’ve been searching for. We love sharing our progress and our collaborative impact with everyone. Full transparency is key, and we want to make sure that every individual who becomes a part of GoodTravels can see the direct impact that they themselves have. We’re all in this together, and we’re all about inclusiveness. 04. Seek to grow and improve. While our main objective never changes, our approach is ever-evolving. We thrive on the feedback of our GoodTravelers so that we can continue to improve our programs and applications. There is no foreseeable end here, there is only the journey, and the only way is forward, together. Unlock special deals and get the latest updates. Sign up for our newsletter!